November 25th, 2012 | Tags: Lions Club of Tortola Christmas tree light-up Sir Olva Georges Plaza Virgin Islands as Minister for Communications and Works Hon. Mark Vanterpool turmoil Middle East. ROAD TOWN, Tortola, VI – It was the annual Christmas tree lighting at the Sir Olva Georges Plaza last evening Saturday, November 24, 2012, however, the focus was not only on the Virgin Islands as Minister for Communications and Works Hon. Mark Vanterpool also stopped to reflect on the turmoil across the world, including in the Middle East. Hon. Vanterpool said all across the world countries are going through difficult times and noted that in the past week there has been news of turmoil over the Middle East and was thankful that a truce was made and hopes it will be a lasting truce. “We want to wish them well in their time of disturbance, we want to hope for them peace and joy in this world,” the Minister stated in front of a crowd of more than two hundred persons. 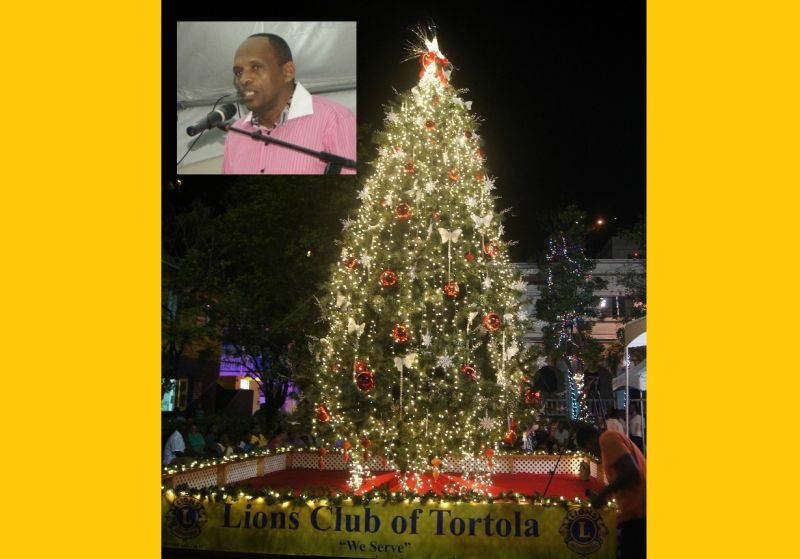 Meanwhile, this is the 40th year for the tree lighting ceremony, which has been a collaborative effort between the Leo and Lion clubs of Tortola. Hon. Vanterpool, who is also the 4th district representative, said he has attended the annual Christmas tree lighting ceremony many times in the past including in the capacity as District Representative, and joked that he had taken a four-year vacation and is now back. The Minister for Communications and Works also noted that all thirteen members of the House of Assembly (HOA), along with the Hon. Speaker, wished all a Christmas of hope, joy and peace. He said members of the HOA were not sitting still until they can find every way possible to make life in the Virgin Islands better. She also urged persons not to be 'blind-sighted' by the commercial aspect of Christmas but to remember the true significance of the season- the birth of our Lord and saviour Jesus Christ. The colourful lights on the towering Christmas tree were then switched on by Acting Governor V. Inez Archibald. Spectators were then treated to performances by students of the Eselyn Henley Richez Learning Centre, Althea Scatliffe Primary School and HLSCC Chorale among other performers. What kind of hope are you offering to the many persons, many of them nowhere close to retirement age, who your group has taken out of a job? How do you think that they and and their extended families feel? Pause for a while and consider what kind of christmas they are having. Check yourselves. Loads of prayers and tears are going to the Supreme Father every day. I am ashamed for my country - we are the laughing stock of the world. Is this the change people voted for? Please let us all calm down and work together. Mark, Mark, Mark and the NDP ... your political capital has all been spent...we have no hope as you are building a class society with some have-your supporters and the rest of us will have to eat the leaves off the xmas tree! since when Mark became the poster child and spokesman for all 13 members of the House? The old people always say the when you have cocoa in the sun, you always looking for rain .... eh Mark!!! At least we know their side is working for a select few of their supporters. What about the rest of us who supported you? and the rest of the country? The marginalised will surely speak loud and clear next elections if you don't change your narrow-minded victimising ways. They falling into the same trap as last time. Haven't you ever heard of "Above the Law"? some of them are acting this way after just one year!!! SERVICE TO THE PEOPLE has been replaced with empty rhetoric of HYPOCRISY and DOUBLE STANDARDS. Mr. Vanterpool you can say what you want nobody believes a word! Same as last time when he say we going for independence. People worked hard on this program, and all you twisted folk and can do is come on here and turn the event into a nasty political bashing session. Elections are over already, get over yourselves and move on. Congratulations to the LIONS Club for a job well done. The tree is beautiful.